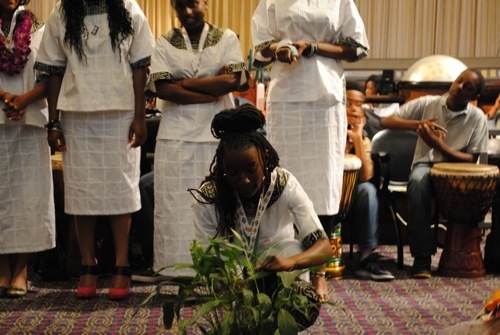 We certainly think we're pretty special, and believe a positive, deeply enriched Afri-centric curriculum provides children with a deep foundation from which to grow and find their calling. 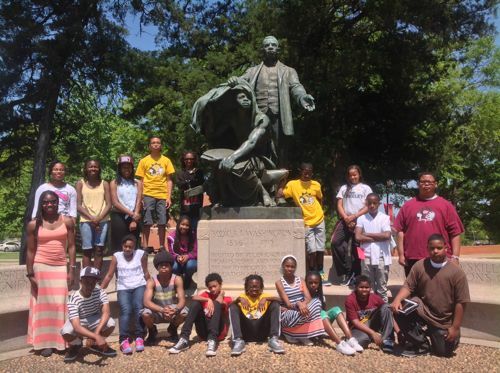 Middle school students on a college and historical tour. What Makes Ile Omode Special? 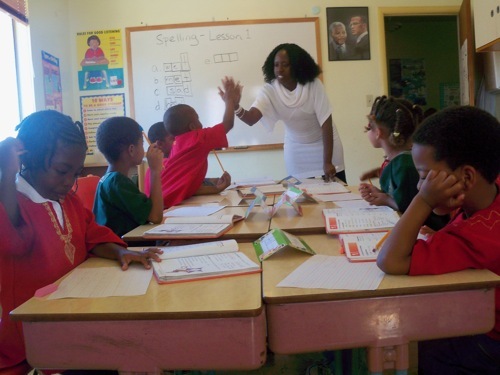 Small class sizes provide students with more attention and better access to the instructor. Young people can not be educated properly in school factories. A number of studies have reenforced what common sense makes self-evident - in classrooms with fewer students, each student receives significantly greater attention. Teachers spend far less time "managing" the classroom (as opposed to teaching), and their instructional time is not wasted attending to non-academic engagements - there is more time to teach. Reducing the students in a class from a typical public-school size of 28 to 10 instantly translates to nearly three times as much attention for each student. Our small environment and close knit family ensures that every child sees school and their teachers as an extension of home. We provide a cohesive sense of family and ensure that parents, grandparents and other extended family members always feel invited and welcomed. 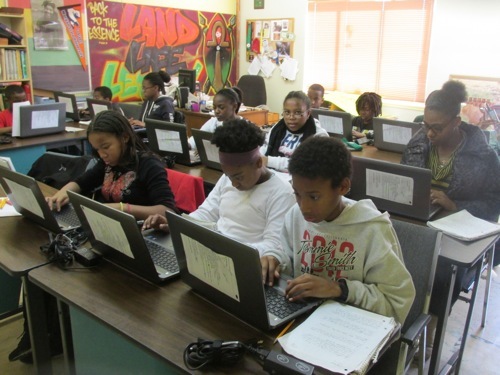 We provide an opportunity for students to enroll at all grades, but anywhere from 80% to 90% of all Ile Omode students matriculate to the next grade. This is why from year to year there may be as few as 1-2 openings for each grade. It is an unfortunate reality in large school systems, but teachers will often spend 5-8 weeks in the beginning of the school year simply reteaching the previous year's material. 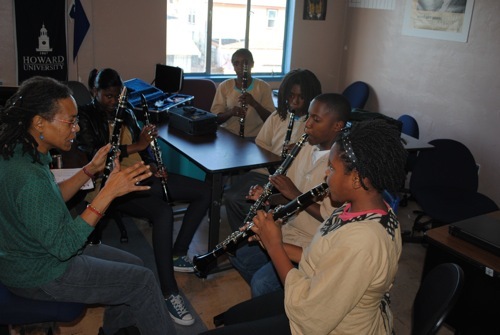 Because students stay within our program we can craft a program that fully exploits this amazing benefit. Middle school lessons, for example, are constructed knowing the curriculum that a student will have received in as early as preschool, and a small educational environment means that a teacher knows of a child well before the student enters their classroom. Thus we're rarely saddled with having to "undo" poor instruction or having to scale a lesson downward to accommodate students who are ill-prepared. And because there are fewer new students matriculating into the program the staff can then focus on the new students' particular needs, and ensure their successful matriculation into the school. 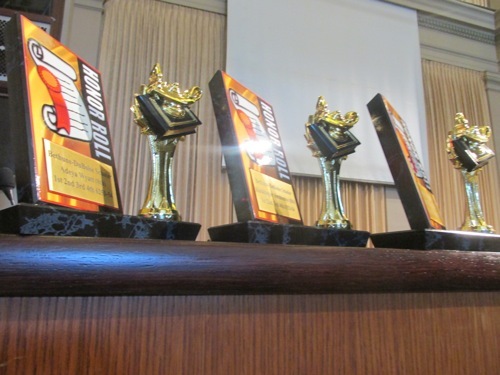 An Ile Omode teacher every fall is not looking at a classroom full of brand new faces, but students that they already know (and who already know them), and who have received instruction that has fully prepared them for the current grade. Why were African-Americans in oppressively segregated communities prior to the 1970s able to achieve successes? How were we able to produce attorneys and doctors? Build schools and hospitals, and create enterprise? Because a segregated community meant that African Americans were surrounded by models of success. Today some students are placed in non-Black environments and feel the weight of being "the other". These environments are rarely racist, but they are also not inclusive and celebrating. A well intentioned adult can inspire a child, but the inspiration is magnified several fold when the model reflects the child. 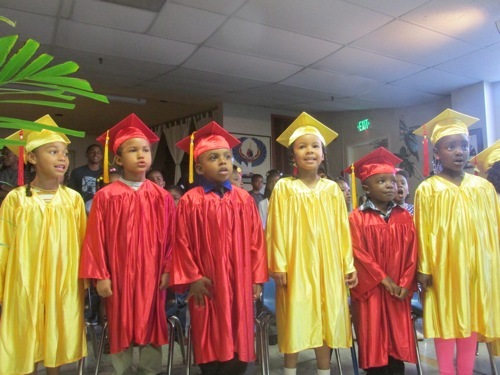 Our cities, especially in Oakland, have schools with large adult Black presence. This however is what we refer to as accidentally Black - just placing Black teachers in a school without an intent to be Black. A successful model that is intentionally African-centered should provide cultural relevancy, high expectations, far-reaching curriculum, and community inspired values and ethics. What does it mean for a child when their interaction with adult African-Americans moves beyond a security guard and yard staff, and includes that child's history, science, English, and math teacher? It then becomes obvious why Howard University awards more doctorate degrees to African-Americans each year compared to every other college in the country, and why Xavier University in New Orleans is responsible for more African-Americans medical school graduates each year, than Harvard and Yale combined? 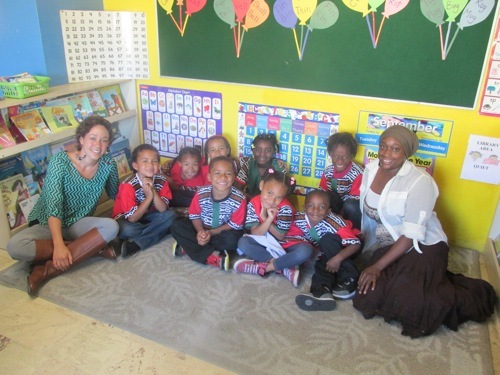 Students at these schools and at Ile Omode can move from fighting against a system, to being supported by a system. Students should be unfettered and allowed to move to the place of their highest challenge. 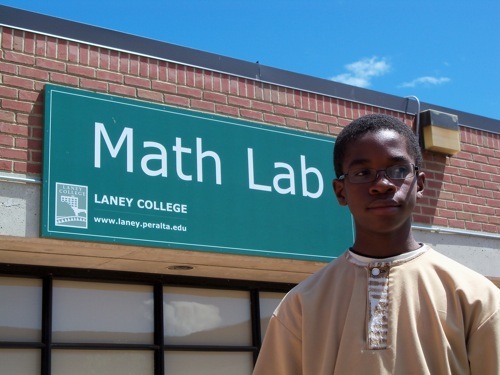 A sixth grade student at Ile Omode is not required to take 6th grade math, but may in fact be better suited for Pre-Algebra or even Algebra. We strive to construct our course scheduling so that a student's aptitude, not their grade, determines their placement. Good high schools offer students courses based on ability, but if a student is pigeon-holed in middle school their course schedule for 9th grade is already predetermined, and opportunities for advanced and/or honor courses becomes very difficult. Advanced track courses exist in high school, but African-Americans are in the minority at both public and private high schools precisely because of a lack of preparation that starts even before middle school, but is certainly cemented by middle school. Student should not sit in a classroom with the mistaken belief that they merely represent themselves. They need to understand that they represent their parents, grandparents, and an entire lineage of "parents" who predate them. This is why the study of history, at Ile Omode, is so powerful. It is our intent to place the student in the flow of human history; to help students understand the specific and tangible connection to the grandparents as well as to historical ancestors, such as Frederick Douglas or Harriet Tubman. This is why we pour libation daily and why classrooms are named after ancestors. It is a part of a continued effort to provide students a historic sense of place, and their responsibility to future generations. Attending a private high school is not essential for students to gain admission to the colleges of their choice, but given the state of public high school offerings within Oakland and neighboring communities (with respect to instruction, safety, and academic advising) it does help. At Ile Omode we assist middle school students in their preparation for private high school admission by working closely with parents in their selection and admission to schools. We also provide preparation for high school admission tests within our curriculum as well as offering special preparatory workshops prior to high school placement exams. 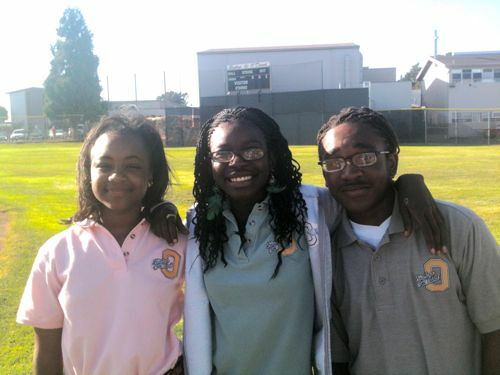 Since extending to a full middle school offering in 2009 our school boasts a 100% private high school acceptance rate. There have always been students who succeed against all odds. Their stories are offered up as near heroic feats, but the more common story, and the most prevailing, is that students generally rise to the level of the expectations around them. When little is expected from a student, than this is exactly what they will produce - very little. Having high expectations is not simply a demand for achievement, "do well in school", but a much more careful assessment and analysis of a student's abilities, skill sets, and environment. We assess the students background, and than ask What is possible, and how to transform the possible into the reality. Students can't simply be told to achieve they must be shown how and guided, and the guides must have a stake in the student's success. At Ile Omode we expect a great deal from each of our students, and we are prepared to help each student meet these expectations. 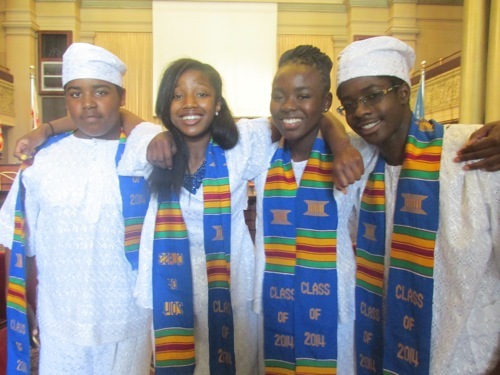 In three years in middle school, Ile Omode students will participate in a college (and historical) tour to Washington, DC and Atlanta, including tours of Howard University, Morehouse College, Spelman College, Georgia Tech and many others. The tours are designed to make college more accessible and more tangible to young students. We want our young students "talking" about college, and the notion of attending and graduating from college to be in ingrained part of their psyche. If we want student to "go to" college, we have to first, "take them to" college. The tours are affordable for all families, and each years several students raise enough money to fund their entire trip.